Today the contractors finally showed up to start repairing my kitchen. The original plan (yes, original plan, be afraid…) was to just demo one wall, the one with the leak, and rebuild it properly. It’s an outside wall that was an addition onto the house. They walled in the porch in the 60’s and turned it into the kitchen, but this addition does not match the build quality of the rest of the home. At all. We are also planning on re do the roofing, so we contacted the best roofing contractors in bellroofcompany.com. 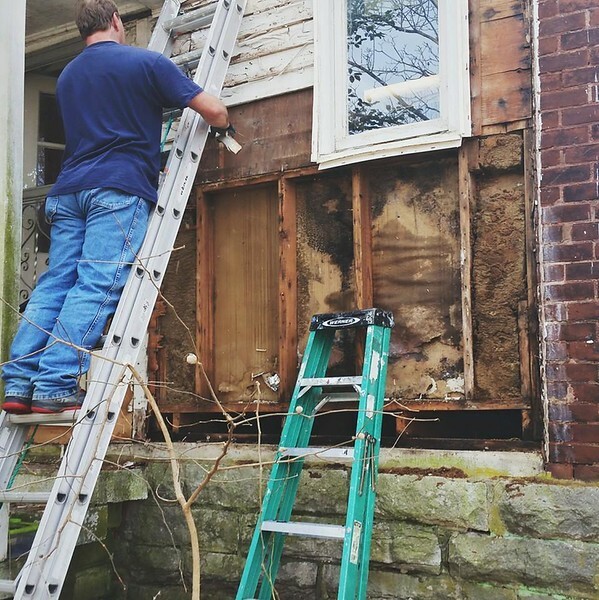 Today I stood there and watched them rip the siding off of this walled in porch, my kitchen, and…it was nasty. As soon as they popped off the siding the smell was overwhelming. The contractor immediately freaked out and said he had to leave to go talk to the property manager about this face to face. Since this leak started I’ve had a random painful ear infection. I haven’t had an ear infection since I was a kid! I’ve also had major sinus pressure and a sinus headache every single day. My ear drum feels like it’s going to rip out of my skull. I think I need to go lay in bed and die of toxic mold. Thank goodness this house is so big. The kitchen is way downstairs behind a closed giant, solid wooden door. I’m no where near the mold on a constant basis. It just takes a tiny bit to send my body into spasms of histamine insanity though. The contractor called me and said that he was insisting they replace the entire kitchen. He called the owner himself to tell him that under no circumstances would he cover this up and let it go. He told me replacing the entire kitchen means he will tear everything down. All that will be left in there is the concrete slab under the floor. No walls. No cabinets. No floor, not even the floor joists will remain. Then the contractor told me that I needed to go ahead and take everything out of the kitchen tonight. (This conversation occurred at about 5:30 in the evening today.) He said they’ll start first thing tomorrow morning by sealing off the kitchen to prevent mold from spreading, and then they’ll begin demolition. In case you’re wondering, moving every single item out of my entire kitchen was super fun. Thankfully my mom came over to help. Tyler helped carry stuff, but his organizing skills are not so top notch. Then Tyler put the kids to bed while my mom and I finished up. It took several hours of hard work. I’m not sure what this new kitchen will look like. The owner has a reputation for being cheap. God only knows what he will select for the cabinets and counter tops, or the paint colors. (Did I ever mention how much I hate renting??) I hope he lets his wife do it. Most people would be agonizing over how to make their brand new kitchen awesome, but I’m sort of certain this will involve the cheapest products the home improvement store offers. I think the scariest part is linoleum. I can’t handle ugly flooring. On the other hand it will all be new, so there’s that. I have to ask him tomorrow how long he thinks this will take. Having no kitchen at all will be wonderful. I do have alternate cooking plans, at least. I put the kitchen table in the foyer with the microwave and the toaster oven on it. There’s also space to use the electric griddle on the table. Oh and the crock pot, don’t forget that lovely thing! I’m putting a pork tenderloin in it tomorrow. My biggest problem will be washing dishes. I can use disposable ones some, but I will still have to use a spatula when I make scrambled eggs for example. I will need to wash out the crock pot too. I guess I’ll wash them in the bathroom sink downstairs? Hrm. It’s a tiny sink! The refrigerator is being moved into the other foyer. (My house is ridiculous, it has two foyers.) That’s just outside the kitchen door. I’m a tiny bit (ok more than just a tiny bit) sad for my vintage kitchen. The avocado green sink is awesome. The fruit wall paper too. The burnt orange paint! The linoleum that looks like bricks!! And the cabinets, those are the same one my grandparents’ farm house had when I was a kid. My grandparents had the same linoleum too. Anyway, tomorrow that kitchen dies. I’m ready to get the party started. Out with the old, in with the new, right?